Bryggen has been a place of trade for a thousand years. But now the wares have changed. Ceramic Vikings stand alert on shelves and tables, surrounded by vases, artworks and tools covered in clay. Somewhere among them is a stereo system playing a cello concerto, unexpectedly loud. “I need music for my work.” says Elin Brudvik from deep within the room, as she turns the music down. She was just shaping a bowl of wet clay on a potter’s wheel. The atmosphere in the pottery is that of an intimate and private workshop, just as much as an open outlet. The space that Brudvik shares with a fellow artisan is located in one of the few stone buildings on Bryggen in Bergen – once the main hub for trade between Norway and the Continent, going back nearly a thousand years. To the outside world, Bryggen is, first and foremost, a façade, albeit an iconic one. The tall and slim wooden townhouses standing gable to gable along the quayside, seemingly leaning on each other, are instantly recognizable as a symbol of Bergen. What you don’t see from the street, is that today you’ll find potters, jewelers and artists, and textile and leather crafters’ shops lining either side of the tiny alleys between the rows of historic houses. “We are open all year. There’s a lot of small, exciting events going on that even locals should pay much more attention to,” says Brudvik, who stresses that she does not adapt her style to serve the tourists in summer. “I don’t make souvenirs. I do my own thing.” Brudvik is one of many. Yet just some 50 years ago, the story was a rather different one. “Bryggen has a tremendously original community and its own, distinct identity. 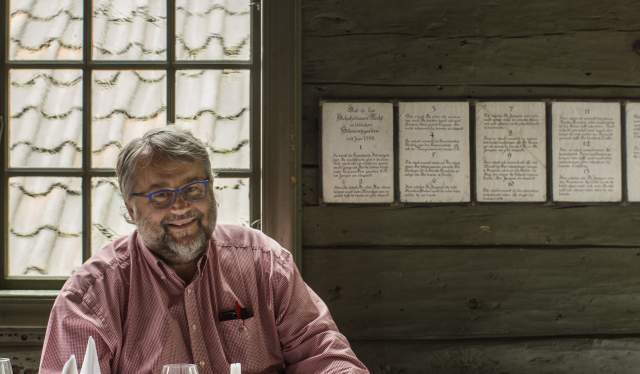 But it is nearly a miracle that it turned out like this,” says Eric Saudan, proprietor of Bryggen Tracteursted, a restaurant that played a key part in reinvigorating the area back in the 70s. Through nearly a millennium of trade and commerce, the area teemed with life and vibrancy. By the mid-1900s, though, the old merchant houses and storerooms stood abandoned and in poor repair, outrun by history. When the last in a series of large fires struck in 1955, the general mood was to let the whole place burn to the ground. “Now it has become a center of creativity, full of genuine people who care about what they’re doing,” says Saudan. 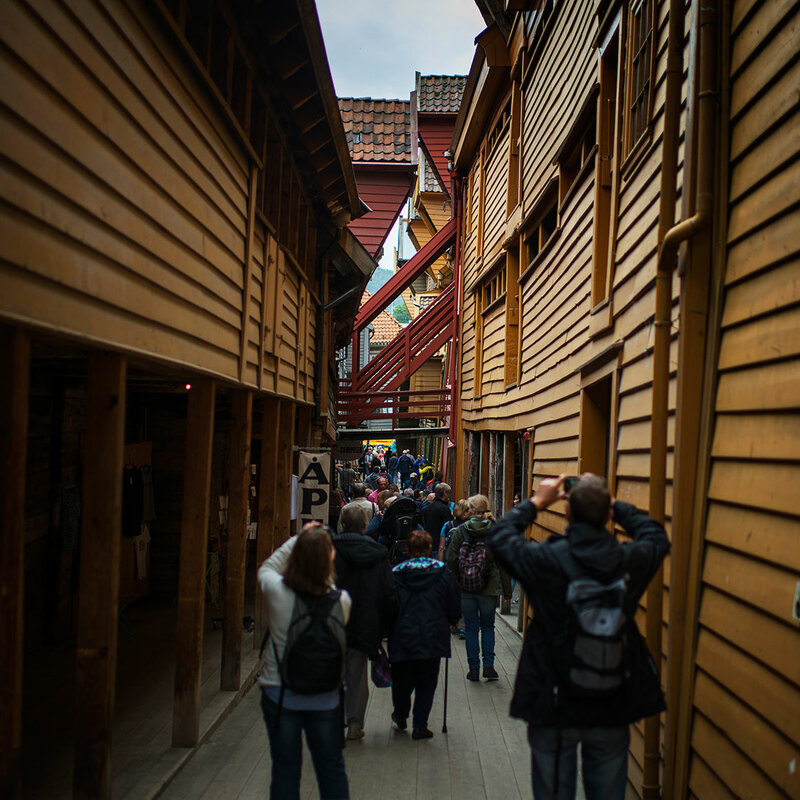 Bryggen went from the brink of destruction, to being a cultural leader and being named a UNESCO World Heritage Site. The history of Bryggen goes back to about the year 1070, shortly after the Viking Age. Located at an easily defendable position, it was still within reach of ships both from the far north, Iceland and the Continent. It became an important Nordic trade hub. 300 years later the Hanseatic League established their office, and had a huge influence on the city for hundreds of years to come. Back in the day, the sweet scent of tar among the wooden structures would have been overpowered by a heavier odor of dried fish. Tons and tons of it. The German Office had secured a monopoly on the export of dried and salted cod from the rich Norwegian coastline to the north. In return, they brought grains and cereals, salt and more luxurious wares back from the Continent, to be distributed up the coast and into the country. Bergen was never an official Hanseatic City, but the Germans claimed this whole area for themselves, so the old city center and town hall had to move elsewhere. The Germans also made the beautiful old St. Mary’s Church their own, holding sermons in German into the 1900s. For the next several hundred years the settlement grew ever larger, at its busiest, some 2.000 Germans lived and worked here. The Office was active till 1754, when Norwegians finally took over. Now, then, the Norwegian traders themselves have been relieved. 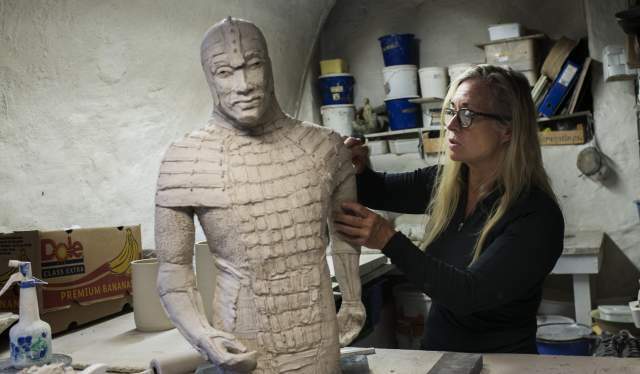 One artist, who has been at her loft at Bryggen since the beginning, is Marianne Lien. “It still only keeps about 11 degrees Celsius in winter, and drops of water keep falling on my head. But I’m used to it. It does have its charm,” says Lien. Open the doors to Bergen’s wooden shops and bars. Dive into the way of life that make this city world-famous.